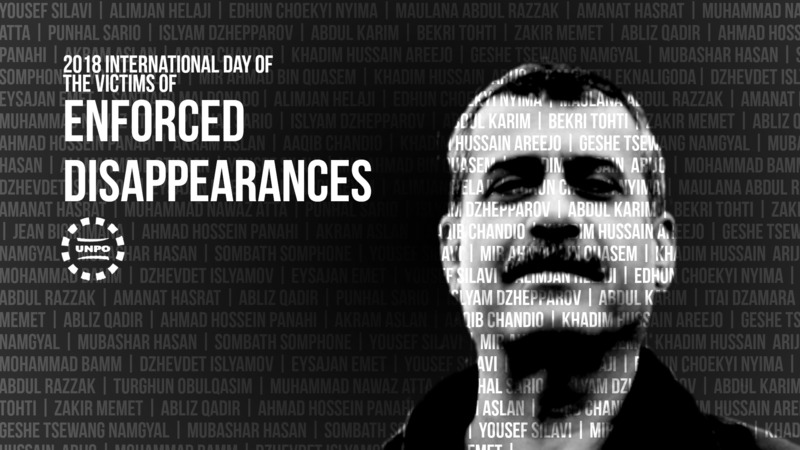 Since 2011, 30 August has been the International Day of the Victims of Enforced Disappearances. Enforced disappearance remains a global problem that afflicts people in various countries and with different ethnicities, religions and political backgrounds. The Day of the Disappeared sheds light on an issue that does not only violate various human, civil, economic, social, and cultural rights of the victims and their families, but also affects whole communities by spreading terror and a feeling of insecurity among them. UNPO stands with the victims of enforced disappearances and their family members all over the world, actively making efforts to raise awareness of this multifaceted violation. In addition to closely following and raising awareness for individual cases of enforced disappearances, such as Ahwazi human rights activist Yousef Silavi, UNPO urges governments and institutions to ensure justice for the victims, hold the perpetrators of these heinous crimes accountable and prevent more people from falling victims to this gross human rights violation. The United Nations has repeatedly expressed concern over enforced disappearances, not only by attempting to draw attention to the issue at large, but also by issuing resolutions to hold those who commit these severe human rights violations accountable. On 18 December 1992, the UN General Assembly passed the Declaration on the Protection of All Persons from Enforced Disappearance, thereby enshrining its members’ conviction that all States ought to take effective measures to prevent, punish and put an end to acts of enforced disappearance, which the General Assembly defined as a severe threat to the right of life itself. More than a decade later, after realising that a treaty that established the right not to be subjected to enforced disappearance was still lacking, the UN General Assembly then adopted the International Convention for the Protection of All Persons from Enforced Disappearance in 2006. A legally binding instrument for those countries who ratified it, the Convention includes a monitoring body which, recognising the extreme seriousness of the act, states that enforced disappearances represent a “crime against humanity when practiced in a widespread or systematic manner”. Defined in the Article 2 of the Convention as the “arrest, detention, abduction or any other form of deprivation of liberty, followed by the refusal to disclose the person’s whereabouts or to acknowledge that their liberty was deprived”, enforced disappearances are only considered as such if perpetrated by State actors or groups or individuals associated with it. Despite international efforts and condemnation, enforced disappearances are to this day an alarmingly widespread issue and, in most cases, are committed with impunity. UNPO wishes to take this year’s International Day of the Victims of Enforced Disappearances as an occasion to remember the many victims of enforced disappearances, many of whom belong to minorities and indigenous groups UNPO works with. The Islamic Republic of Iran is one such example of a country where cases of enforced disappearances are rampant and largely committed with impunity. A country with a wide, complex range of ethnic, cultural, linguistic and religious diversity, the Iranian government has historically employed violent means to suppress diversity and silence those who dare speak up for minority rights. Sadly, the enforced disappearance of Ahwaz human rights Yousef Silavi in 2009 is but one of thousands of cases. On 28 April 2016, Amnesty International reported that Iranian authorities, to this day, have not disclosed the fate and whereabouts of Mr Silavi. A retired technician who himself had not been politically active, Mr Silavi was most likely abducted simply because his cousin was an advocate for the rights of the Ahwazi community’ and because his wife’s family is a prominent and politically active Arab family. Reported missing on 8 November 2009, Mr Silavi remains at risk of torture and other ill-treatment and even extrajudicial execution, while his wife, his two daughters and other members of his family are forced to live with the uncertainty over his fate. Just like Mr Silavi, thousands of other innocent civilians have fallen victim to enforced disappearance in Iran and, as is the case with Mr Silavi’s family, Iranian authorities refuse to disclose any information about their fate or whereabouts to the family members of the disappeared. In order to keep the names and the memory of their loved ones alive and hold Iranian government responsible, the families of victims in Al-Ahwaz, Iranian Kurdistan and Iranian Balochistan launched the #Where_is_my_child campaign on traditional media and social media. In the South-Eastern part of Iran and across the border, in Pakistan, the Baloch people are equally affected by enforced disappearances carried out by agents of the state. In August 2018, the Human Rights Council of Balochistan and the Baloch Human Rights Organisation published a comprehensive report documenting that, in the first few months of 2018 alone, 541 people had been forcibly disappeared in Pakistan’s Balochistan province. Although activists who speak up for the rights of the Baloch people are usually the direct victims of this crime, the report also highlights the abduction, torture and intimidation of civilians who are not politically active or human rights activists. Just as is the case in Iran, the families of the abducted often refrain from reporting these crimes for fear of reprisals, even though the abductions often happen in broad daylight, with the Pakistani security forces not even trying to cover up their actions. Further East, the people of Sindh also fall victim to this most heinous human rights violation. To raise awareness of these gross violations of both national and international human rights standards, students and activists carried out a rally in support of the thousands of victims on 23 May 2018, garnering the support of human rights activists, members of civil society and regional parties. Despite of their efforts, however, the whereabouts of more than 140 Sindhi people remain unknown. The People’s Republic of China is another country that resorts to enforced disappearances to silence minorities’ attempts to speak out for their rights. While, tragically, Beijing is largely successful in keeping these atrocities hidden from the international community, the Uyghurs of East Turkestan in particular are systematically targeted. It is only in recent weeks that international media outlets picked up on the issue and reported on the mass forcible disappearance and internment of Uyghurs in so-called “re-education camps”, where they have to endure solitary confinement, beatings and other forms of physical and psychological torture aimed at systematically repressing and eradicating their culture and religion. Although the United Nations’ Committee on the Elimination of Racial Discrimination (CERD) has expressed serious concerns over these mass violations of the rights of Uyghurs, Tibetans and Southern Mongolians and even though China is a signatory to the Convention on the Elimination of All Forms of Racial Discrimination since 1981, the Chinese government continues to deny the massive internment of Chinese minorities. Other examples abound: members of the Ogaden and Oromo communities in Ethiopia, indigenous Crimean Tatar activists, intellectuals and politicians on the Russian-occupied Crimean Peninsula or environmental and indigenous human rights defenders in Latin America are but some examples of regions where enforced disappearances are used by governments and affiliated security forces to instill fear and terror. Faced with the worrisome fact that the number of cases of enforced disappearances is rising rather than decreasing, it is important that today is not only a day to remember the victims of enforced disappearances and their families, important as this is. Rather, this day should also be about the future and serve as an occasion to remember the need to continue working towards changing the status quo. While this struggle might at times seem like an uphill battle, it is all the more important to focus on the overall goal: to reduce the number of names on the list of victims of enforced disappearance and to hold those who commit these crimes with impunity accountable by making it clear that the world has not forgotten about the thousands of forcibly disappeared across the globe.